As the world has grown increasingly dependent on computers and other electronic devices, the sheer volume of e-waste has expanded to mammoth proportions. With Americans generating over three million tons of e-waste yearly, we are flooding our landfills with discarded electronic hardware containing elements that are toxic to humans and the ecosystem. 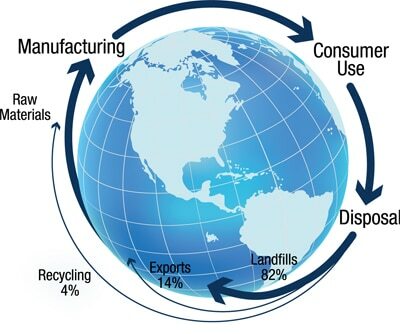 TechnoCycle’s mission is to ensure that all electronic waste is responsibly recycled and kept out of landfills. We can achieve this mission by partnering with individuals, businesses, and local government to responsibly recycle their end-of-life electronics. Fill in the form below and we will respond to you within one hour during business hours. © 2019 TechnoCycle. All Rights Reserved.